Police in Manchester on Saturday released new photos of bomber Salman Abedi from the night of the attack outside an Ariana Grande concert as officers raided an apartment where it's believed he built the bomb used in the blast. Police are hoping the photos will help people to come forward with any new information about Abedi on the night of the bombing that killed 22 and wounded dozens of others. The terror threat in Britain was lowered from "critical" to "severe" as officials said they had rounded up a majority of Abedi's associates, CBS News' Jonathan Vigliotti reports. "They're very significant, these arrests," said Assistant Commissioner Mark Rowley. "We're very happy we have got our hands around some of the key players that we're concerned about. But, as I say, there is still a little bit more to do." Searches are still taking place at a handful of locations around the city. Police said 14 locations have been searched and 13 people have been arrested. 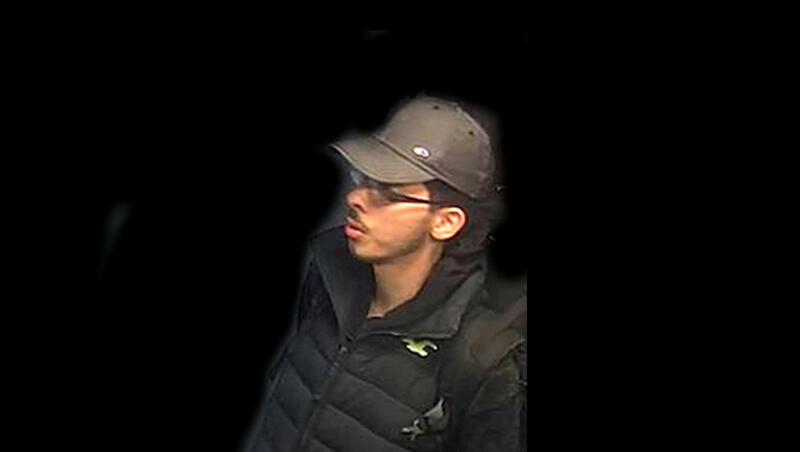 The photos released by police show attacker Abedi, a Briton of Libyan descent, on the night of the bombing, wearing sneakers, jeans, a dark jacket and a baseball cap. The straps of a knapsack are visible on his shoulders. Greater Manchester Police chief Ian Hopkins and Neil Basu, the national coordinator of counterterrorism policing, urged people to contact police if they had information about Abedi's movements between May 18 and Monday night. "In the past five days, we have gathered significant information about Abedi, his associates, his finances, the places he had been, how the device was built and the wider conspiracy," they said in a statement. U.K. lowers terror threat level from "critical" to "severe"
"Our priorities are to understand the run-up to this terrible event and to understand if more people were involved in planning this attack." British Prime Minister Theresa May said "a significant amount of police activity" and several arrests had led to the level being lowered. But she urged Britons to remain vigilant and said soldiers would remain at high-profile sites throughout the weekend, and start reducing their presence beginning Tuesday. A severe threat still means an attack is "highly likely," according to the scale set by Britain's Joint Terrorism Analysis Centre. Rowley, Britain's top counterterrorism police officer, said authorities have dismantled a "large part" of the network around bomber Salman Abedi. But Rowley said there were still "gaps in our understanding" of the plot, as investigators probed Abedi's potential links to jihadis in Britain, Europe, Libya and the Middle East. "There will be more arrests and there will be more searches," he said. Police made two more arrests in Manchester on Saturday on suspicion of terrorism offenses, bringing the number of suspects in custody to 11. All are men, aged between 18 and 44. In addition, Abedi's father and younger brother were detained in Libya. Police disclosed new details about Abedi's' movements, saying he returned to Britain four days before the attack. His father has said Abedi was in Libya until earlier this month and had told family he planned to go to Saudi Arabia on a pilgrimage. Police say they think Abedi assembled his bomb at a rented apartment in central Manchester that was raided by officers Wednesday. Investigators have searched 17 properties, including Abedi's home in south Manchester and other houses in nearby districts. Residents were evacuated from streets in the south Manchester neighborhood of Moss Side in what police called a precaution as one search was carried out Saturday. Photos showed an army bomb-disposal unit at the property. Another place searched was an apartment in a Manchester high-rise that British media say was rented by Abedi in the months before the attack. Mohammed El-Hudarey, a friend of the landlord, said after Abedi moved out about six weeks ago there was a strong smell of chemicals and debris including metal rods and cut-up fabric. "We thought he must have been a drug dealer or doing witchcraft," El-Hudarey told the BBC. Armed police were on the streets outside London's Wembley Stadium, and security guards conducted extra bag checks, as 90,000 fans arrived for the FA Cup soccer final between Chelsea and Arsenal, one of the biggest sporting events of the year. Before kickoff, Prince William laid a wreath in memory of the victims alongside Manchester Mayor Andy Burnham. The stadium held a minute of silence for the bombing victims. Arsenal fan Liz Johnson said she was "sad after what happened in Manchester. But I grew up in Ireland, so bombs did go off there and life does go on." "We will be thinking about all the people who died and were injured," she said. Former U.S. President Barack Obama offered his condolences to the victims and support for those wounded in the Manchester bombing during a meeting Saturday with Prince Harry at London's Kensington Palace. Britain's health service said Saturday that 63 people wounded in the bombing remain hospitalized, 20 of them in critical condition. Grande, meanwhile, promised to return to "the incredibly brave city of Manchester" to hold a benefit concert for the victims. "Our response to this violence must be to come closer together, to help each other, to love more, to sing louder and to live more kindly and generously than we did before," she said. "We won't let hate win."